I am Jason Bushman and I interviewed my grandfather Leroy Vincent Bushman at his home in Perry, Oregon. He was drafted right out of high school to be in the war. He chose to be in the navy when they asked him which branch of service he wanted to join. He worked below deck as well as transporting soldiers on landing crafts to the many islands for combat. Right after high school, Leroy was sent to San Diego, California to basic engineering school to become an engineer with the machinery. He then went to the naval training station. 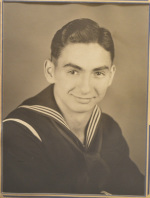 He was in the Pacific Ocean during World War II. He went all the way from New Caledonia to Japan. He was transferred from the U.S.S Bosque when it was decommissioned and had duty on the U.S.S Iowa. Leroy was in Tokyo Bay when the Japanese signed the act of unconditional surrender. He was anchored in the bay with other ships. Right after the Japanese surrendered, they landed the first occupation troops in Japan to keep order. Before he was drafted, he worked for the signal department for the railroad. He then finished school and was off to the war. After the war, he came back and about a week after he got home from the war, he walked into the supervisor’s office of the railroad and asked if he had any work for him. He started work the very next day.